Heart candle holders make a unique centerpiece and gift idea for Valentine’s Day or an anniversary. Painting gorgeous faux stained glass hearts on votives and candle holders is easy. You can even personalize them! Use glass paint to create faux stained glass heart candle holders. Creating gorgeous stained glass heart decorations on votive candle holders is easy. Anyone that can draw or trace can paint a faux stained glass heart. DIY candle holders make great gift ideas for Valentine’s Day, Mother’s day, Father’s Day and anniversaries. They also make a lovely centerpiece. They can even be personalized! Download and print our small heart template or, use a black glass paint outline tube to draw your own heart. 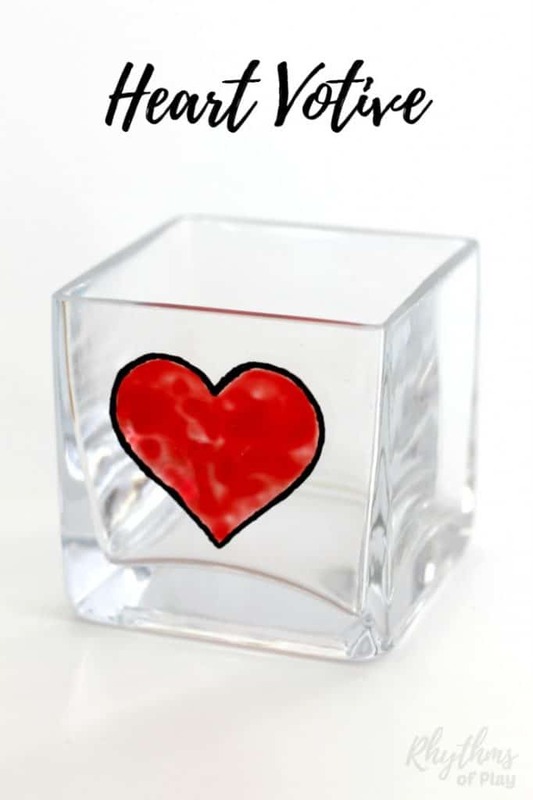 If you are using the small heart template, cut it out and tape it to the inside of the square votive to hold it in place. Tip: Cut the small heart template to fit inside the square votive so the bottom edge of the template rests on the bottom of the inside the square window of the candle holder. This will make it easy to reuse over and over again without having to measure! Use a black glass paint outline tube to trace the small heart template, or draw your own design onto the outside of the candle holder. Make quadruple heart candle holders by painting a heart on each side of a square votive candle holder. Click on the link to see examples. Allow the black outline to dry for at least 24 hours before moving on to the next step. Use glass paint, to color the heart. Painting with glass paint is a bit different than other paints. Load your brush with glass paint and dab as much as you can into the black outline of the heart. The more paint the better. If you brush it on in a thin layer you might not be able to see the heart very well once it dries. For best results allow the heart to dry for a minimum of 24 hours. Once your faux stained glass hearts on the candle holders are dry you can personalize them. Click the link to find out how! 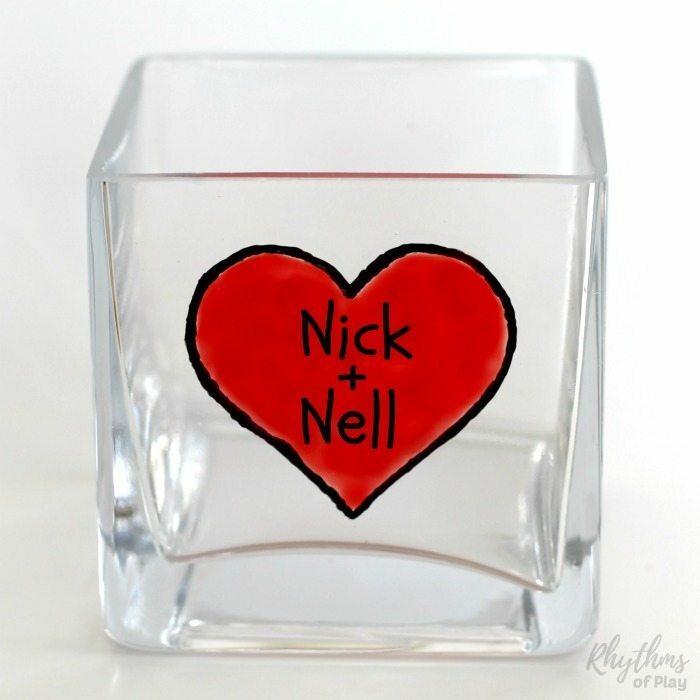 Personalize heart candle holders for an extra special touch. A handmade DIY glass paint heart votive candle holder would make a wonderful centerpiece or homemade gift idea for Valentine’s Day or an anniversary! You may also like our Mother’s Day and Father’s Day candle holder gift ideas. Click on the links to see them all. We have also used glass paint to make framed stained glass pictures. Pop on over to have a look at our heart tree and lovebirds. For more DIY and ready-made gift ideas for the whole family click HERE.